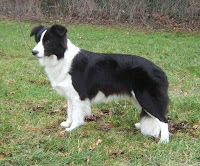 The Border Collie is a dog breed that was developed for use on farms to help in the herding of livestock in the Scotland England border region in the 19th century. Presently they are favorite farm worker, companion animal and multitalented show dog. They are very dynamic, acrobatic and sporty and thus compete successfully in dog sports, and are also successful in sheepdog trials. This breed is considered to be the most intelligent of all breeds.